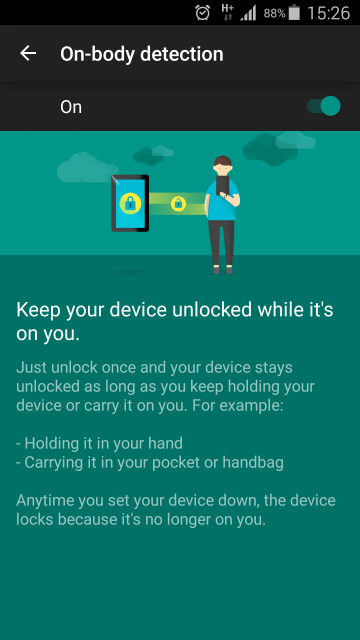 The Android Lollipop operating system provides for the first time the feature "Smart Lock". With Smart Lock you can use your smartphone without a Lock in certain circumstances or situations. These are trusted devices or trusted locations. To these options the following is now added: function "On-Body detection"
The On-Body detectionin Android Lollipop allows that the smartphone is unlocked as long as you keep it in your hand or carry in your pocket. Every time when you put your device on a table the lock enables itself and you need your pin again to unlock the lock screen of your smartphone. The On-Body detectionis therefore a very useful feature to not always use the pin or the fingerprint sensor if you want to use the phone. Here you will see an option with "On-Body detection". Tap on it and you,see the screen shot from above. Activate the On-Body detection via the controls on the top right. Finished! Now you know how to activate the "On-Body detection" in Android lollipop.